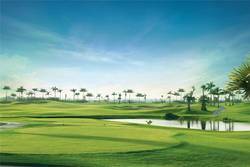 (excellent course on private island in the Saigon River) Taekwang Jeongsan Country Club is location on its own island in the Saigon River. Travel to the Ho Chi Minh City golf course requires golfers to travel out of the city on Vietnam’s main north-south highway and take a ferry across the Saigon River. All in it takes around 90 minute to reach the golf course from the main hotel districts in Ho Chi Minh City. The 18-hole Korean owned course was developed by Ron Fream’s Golfplan Company from the USA. The out and back layout is typical of top resort courses. The tips stretch out to over 7500 yards, but there are forward tees for those looking for a more relaxed round of golf. Heavy bunkering on most holes of this otherwise flattish land adds interest and enjoyment throughout the golf course and poses challenges even for the most serious professional golfers. Wall-to-wall Paspalum grassed fairways, greens, and tees insure good conditions and favorable ball lies. The front nine plays along the river with some excellent views to the right of several holes. Holes 9 and 18 are the two signature holes with 9 being a long par-4 and 18 being a dogleg par-5. Both play right to the clubhouse so make sure to play the correct green. Both holes share a bunker between the number 9 green (left) and number 18 green (right). Playing on the Out (Sun Course) and In (Moon Course) ends up a very overall enjoyable day out golfing in Saigon. The massive clubhouse forms the anchor for residential and commercial areas, which are off to the side of the Jeongsan course. Inside the clubhouse golfers will find elaborate locker rooms with spa facilities, two restaurants serving local and Korean favorites, and a well-stocked pro shop. Insider's Tip: for Ho Chi Minh City golf visitors there is a speed boat service from the pier in District 1. This is very convenient and speeds the commute time to Jeongsan only 30 minutes. Book this service and golf at Jeongsan Country Club will be even better than using the highway/ferry.